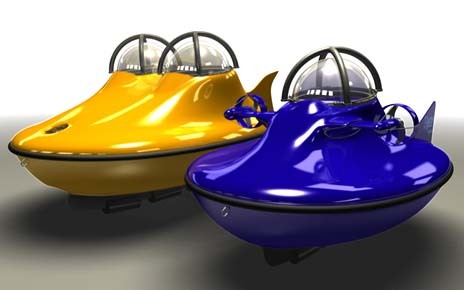 U-Boat Worx has developed two types of the C-Quester submersible. The CQ1 for one person and the CQ2 for two persons. Both the CQ1 and the CQ2 are based on an unique concept called the “Underwater Boat”. This concept combines the characteristics of a submersible -“the Underwater part”- , with those of a normal vessel -“the Boat part”. The C-Quester is so-called 1-atmosphere “dry” submersibles. This means that both the pilot and the passenger are in a normal one-bar, dry environment. C-Quester can dive directly to the maximum depth of 50 meters and stay here to enjoy underwater flora and fauna, limited only by the life of the electrical power supply. Bling H20 - Water for Idiots?